World Snooker Legends Final Chosen Charity! We are absolutely delighted to announce that we’ve been selected to be the chosen charity for the World Snooker Seniors Legends Tour Final! 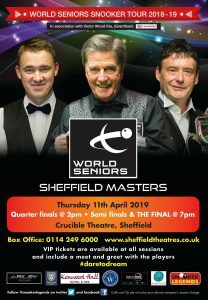 The Final takes places on April 11th 2019 at the Crucible Theatre Sheffield – and we can’t wait! It’s such a proud moment for us to have been chosen as the charity for what will be such a great end to an amazing tour!